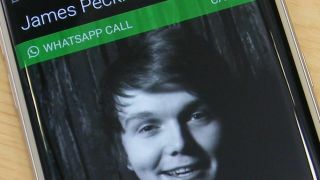 WhatsApp is already one of the most popular methods of communication, with over one billion users, and with the addition of a video calling feature it could become even more popular. It looks like that feature is coming soon too, as Fone Arena reports that a recent WhatsApp beta on Android included a video calling option. You can see evidence of it in the screenshot below, with the call button apparently bringing up a choice of audio or video call, rather than just launching straight into an audio call as it normally would. Reportedly some users were able to make video calls using the new option, but there's no evidence of that and the button was seemingly inactive for most. It's already been patched out, so you won't be able to test it for yourself, but the option showing up at all suggests WhatsApp could be launching the service very soon. Having said that, evidence of a WhatsApp video feature coming to the iOS app emerged late last year and the feature still hasn't arrived. On top of that even once it does launch it's likely to be a very gradual roll out, just as it was for voice calls. But it now seems almost certain that sooner or later WhatsApp will let users stare at each other's faces while talking. Along with WhatsApp's new desktop app and the rumored addition of voicemail this will make the popular service an even stronger competitor to Skype, FaceTime and the humble phone call.